The Doctor and Mel face the final confrontation with the Valeyard – and the Doctor must make the ultimate sacrifice. It all comes down to this. Twenty-eight years after being unceremoniously removed from the role, Colin Baker gets his moment. The Brink of Death is the regeneration story the Sixth Doctor should have gotten. Baker is the center of a story that sees the Sixth Doctor make the ultimate sacrifice to save his companion, the Time Lords, and his own future. There are a few small speedbumps along the way, but they are easily overlooked by Baker giving the performance of the lifetime, overcoming the superb performance by Michael Jayston and giving both the character, the actor, and the fans the one thing they were denied nearly three decades ago – the final chapter for the Sixth Doctor. Nicholas Briggs has transitioned into a director and showrunner for Big Finish, but he has an impressive writing pedigree, with the most recent release being 2013’s 50th anniversary special The Light at the End. It’s no surprise that Briggs was the one to pen the Sixth Doctor’s swan song, as both he and Colin Baker have been involved with Big Finish all the way back to the very first release, The Sirens of Time. 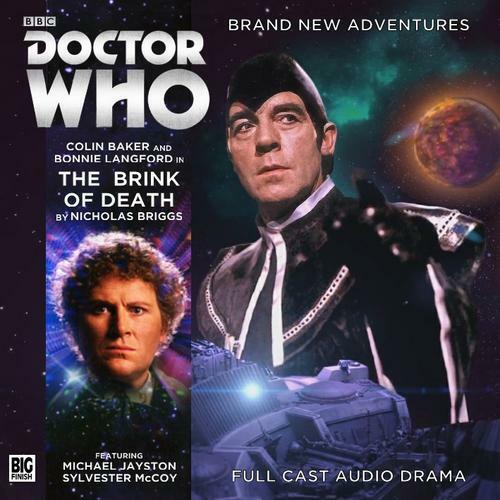 The Brink of Death boasts an impressive script from Briggs, with an intriguing temporary companion and a complicated and diabolical plot by the Valeyard; to subsume the Matrix (first seen in Trial of a Time Lord: Mindwarp) and replace every single Time Lord personality with his own until he is both EVERY Time Lord and the ONLY Time Lord. Briggs keeps the script moving from location to location, filling in the gaps between moments with key plot points and surprises, such as how the Valeyard infiltrates the Doctor’s TARDIS and how the events of the three previous stories tie together into his overall plan. It’s easy to follow, makes narrative sense, and allows Colin Baker to have HIS moments where the Sixth Doctor is everything he should be, from those “moments of charm” all the way to the final stand against the forces of evil and then the last few quiet lines where both the Sixth Doctor and Colin Baker get to say goodbye. I didn’t tear up like I did at the end of Thicker Than Water, but I came pretty close during those final moments…especially during the surprise cameo by Sylvester McCoy, both Doctors existing for just one brief moment to ensure the future was in good hands. The script isn’t all wine and roses, sadly. Two points stood out to me that brought the story down slightly. One moment was the reveal of the Valeyard’s “true nature” – that he was created by the Celestial Intervention Agency’s “black ops” division as the ultimate weapon of the Time Lords meant to take out the Doctor in case he ever got too powerful, but managed to escape CIA control to wreak his own havoc across the galaxy. It’s brought up by Genesta at one point as she’s going through the Matrix archives, and the Doctor confronts her superior about it…but it’s only mentioned during that scene and not brought up again. I’m willing to just believe that the Valeyard planted “evidence” in the Matrix in order to put the Doctor on a false path and waste precious time chasing a dead end, especially since it’s brought up in a scene or two and never really mentioned again. All the focus is placed upon the Valeyard being the incarnation of all the Doctor’s darkest thoughts and actions, and that’s the story I’m going to stick with. The second part is the criminal waste of Bonnie Langford as Melanie Bush. I understand that Mel has to be there when the Sixth Doctor regenerates into the Seventh Doctor for the sake of continuity, but she really doesn’t DO anything during this story. She’s honestly there to provide exposition and give the Doctor a personal reason to rush back to the TARDIS and save her…and that’s it. It’s a bit of a shame, especially considering that Big Finish has done a great job rehabilitating her character since her debut in The Fires of Vulcan and Langford is currently starring in a trilogy of main range releases along side Sylvester McCoy. Langford and Baker have had underrated chemistry throughout their time , and I would have liked to have seen a little more banter between them, especially near the end of the story during the Doctor’s final moments. The part of companion in The Brink of Death is played by Liz White, best known for her performance as Annie Cartwright in the classic BBC series Life on Mars and most recently the mini-series Our Zoo. Doctor Who fans would recognize White as Alice the servant from the 2012 Christmas special The Snowmen. Genesta is a Time Lord technician who realizes the Doctor is more than a program, and offers him the use of her own TARDIS in an attempt to save his life. In many ways, Genesta is a characterization of how fans imagine the Doctor to have been before he stole his own TARDIS and fled Time Lord society. She’s confident, but unsure of her place in the rigid caste system of the Time Lords, and it only takes a little conversation with the Doctor before she’s willing to go against her supervisor and assist the Doctor. White plays the young Time Lord with youth enthusiasm, needling the Doctor even as she does whatever she can to assist him. She mentions her “impromptu” trip to Yorkshire in her early days that inflicted her with an accent and some colorful euphemisms, a personality quirk that endears her to the Doctor. White does a fantastic job endearing Genesta to the listener with her performance, even though the listener knows the Doctor’s promises to take Genesta to London when all is said and done will fall through. It doesn’t make Genesta’s final fate a true twist of the emotional knife, the first truly heartrending moment as The Brink of Death moves towards its conclusion. Serving at the ultimate villain in the Sixth Doctor’s final story, Michael Jayston is truly excellent as he forsakes any notion of charm to show the Valeyard at his absolute worst. There’s no hope of redemption for him, no thought of swaying him to one moment of heroism to save the universe at the cost of his own life. The Valeyard, hands down, is pure distilled evil. Jayston shows pure menace with his turn in The Brink of Death. There’s no cloak swishing or mustache twirling. The Valeyard is out to kill the Sixth Doctor and assimilate every aspect of Time Lord society, no matter what the cost. Each individual meeting with the Doctor throughout the story is a masterclass in “how to play a villain” by Jayston, all the way to the final confrontation. All the venom and hatred comes pouring out of the Valeyard as Jayston tears into Baker about his right to exist, being nothing more than a part of the Doctor. Every great story needs a great villain, and Jayston is happy to provide that villain with an absolutely superb turn. The Valeyard: NO, DOCTOR! Don’t do this! What about your precious moral code? The Doctor: …it dies with me. I hope the footprint I leave will be light, but apposite. When looked at as an overall story arc, The Last Sixth Doctor Adventure is a triumph. It sets out to do what it means to do, giving the Sixth Doctor a fitting farewell story and a victory over that incarnation’s most iconic foe. It touches upon Six’s Big Finish journey as each companion gets their moment in the sun (while making me miss Maggie Stables even more), the Valeyard shows his stripes and capacity for pure evil, but most importantly gives Colin Baker the opportunity he was denied twenty-eight years ago – a chance to go out on his own terms. I believe Stage Fright is the best of the four stories, but that’s no slight against The Brink of Death. It’s everything a regeneration story should be…and we Big Finish fans are blessed that, even though we’ve gotten a chance to bid the Sixth Doctor goodbye, Colin Baker still has plenty of upcoming stories with the company. + …and Colin Baker is simply wonderful. 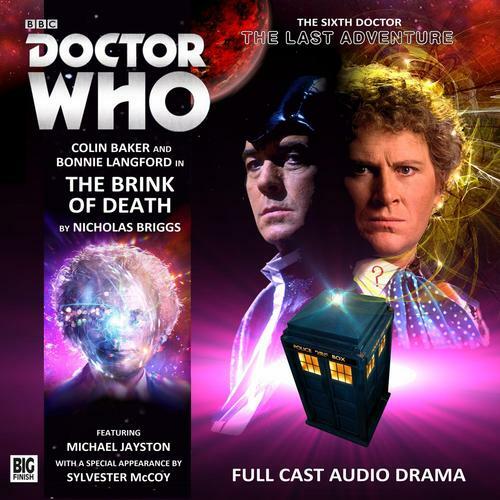 Cobi’s Synopsis – The Brink of Death gives the Sixth Doctor a well-deserved regeneration story, as Colin Baker and Michael Jayston give the performances of the lifetime, allowing the Doctor to go out in memorable fashion. Peter Davison is the Doctor in…Son of the Dragon. This entry was posted in Big Finish Review and tagged Big Finish, Big Finish Audio, Big Finish Review, Bonnie Langford, Colin Baker, Doctor Who, Doctor Who Audio, Doctor Who Review, Liz White, Mel, Michael Jayston, Sixth Doctor, TARDIS, The Last Sixth Doctor Adventure, The Valeyard. Bookmark the permalink.